One easy way to add a bit of a not-too-harsh industrial vibe to your home is with vintage C clamps. Once only used for woodworking and similar construction projects, C clamps can be used to support shelves, add hooks, or secure items where you need them. C-clamps blend well into interior decor. Today’s utilitarian, shiny silver plated C-clamps are generally the economized and simplified versions of the elegant C-clamps made only a few decades ago. Older C-clamps tend to have a dark, or black, finish and styled turnkeys which, although harder to tighten and loosen in a workshop, lend well to interior decor. 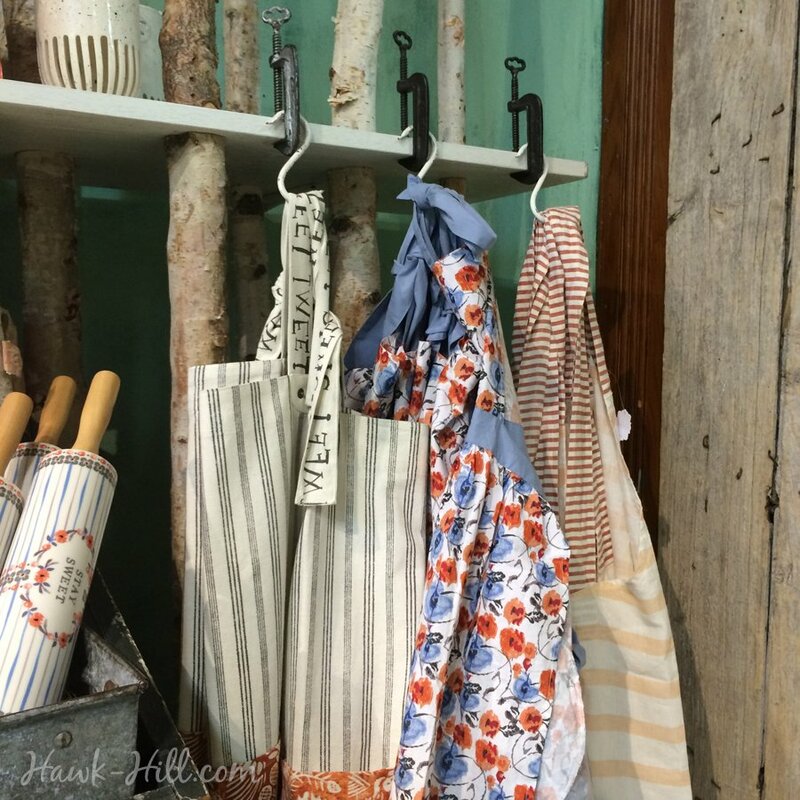 I’ve been using vintage C clamps as decorative and functional elements in my studio’s decor for a few years, but when I spotted them recently employed in use at Seattle’s downtown Anthropologie, I was prompted to share with my readers the how I’ve used old C-clamps for utilitarian interior decor. You can use the top of the clamp as an efficient hook, but in cover the top, you’ll lose much of the visual charm of the clamp. Instead, pair your clamp with an S-hook and hang items from the bottom. Use pliers to bend the top curve of your S-hook inward just slightly, so the hook doesn’t lift free of the clamp when you remove an item from the hook. Ever had to move something heavy, flat, and excruciatingly uncomfortable to between pinchedinched fingers? 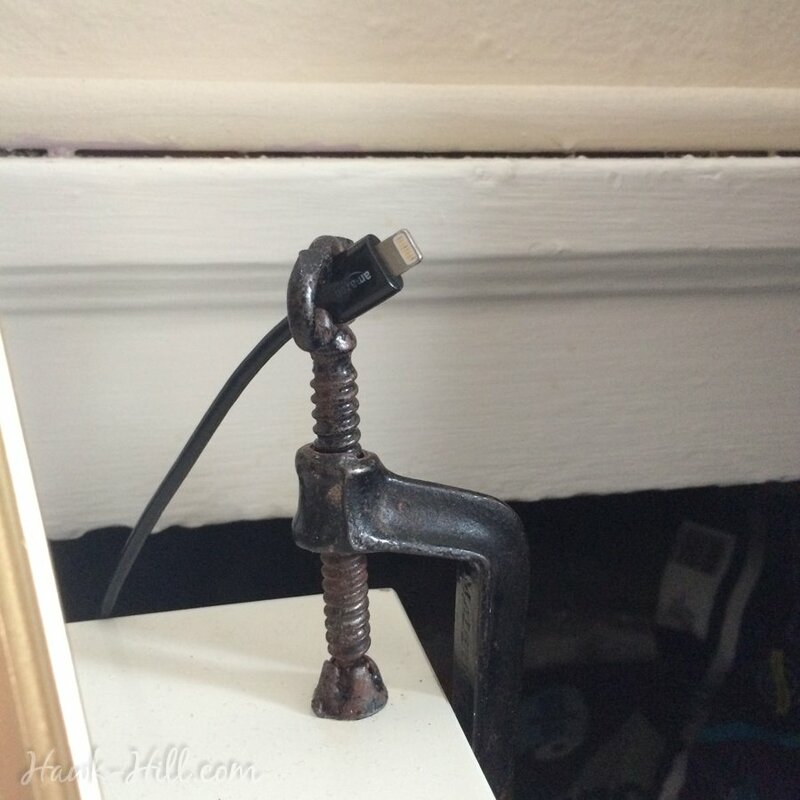 Use a C-clamp to add an easy-to-hold handle. This works GREAT when deep-cleaning horse stall requires dragging heavy and thick rubber mats. Instead of pinching between thumb and forefinger to move, clamp a C clamp onto a corner, tighten, and drag using the clamp as a securely attached handle. This works equally well for carpet or any heavy, flat object.